Toxigenic fungi monitoring. Differences in environmental conditions in Europe as well as in other continents significantly influence the distribution of specific toxigenic fungi and related mycotoxicological risks. Emerging problems due to climate change and new mycotoxin/commodity combinations add further concern. In addition, trans-global exchange of plant products and worldwide trade significantly contribute to the spread of toxigenic fungi. Their monitoring will be approached by studying the fungal biodiversity at a global scale and by developing advanced rapid, sensitive and cost effective methods for the detection of toxigenic fungi. Mycotoxin monitoring. Comprehensive monitoring of mycotoxins and their modified forms at critical control points in the food/feed chains is essential to evaluate the mycotoxin exposure for humans and animals. Multi-mycotoxin analysis consists of screening (e.g. as part of a HACCP approach or autocontrol) and analysis for official control (e.g. as part of sampling plans of national food safety authorities as well as for import/export). The project’s approach on mycotoxin monitoring will contribute to straightforward, fast, timely and cost-effective solutions for growers and other stakeholders in the agro-food industry to reliably determine the amounts of mycotoxins. Prevention in the field. The focus of MycoKey’s prevention approach is to develop novel preventive measures and to improve, combine and fine-tune existing measures. In order to establish an optimised spectrum of preventive and economically feasible actions, an integrated approach will be applied for maize, wheat, barley and for cropping systems, by studying and selecting biocontrol agents, fungal and bacterial antagonists and major plant breeding. Intervention strategies. 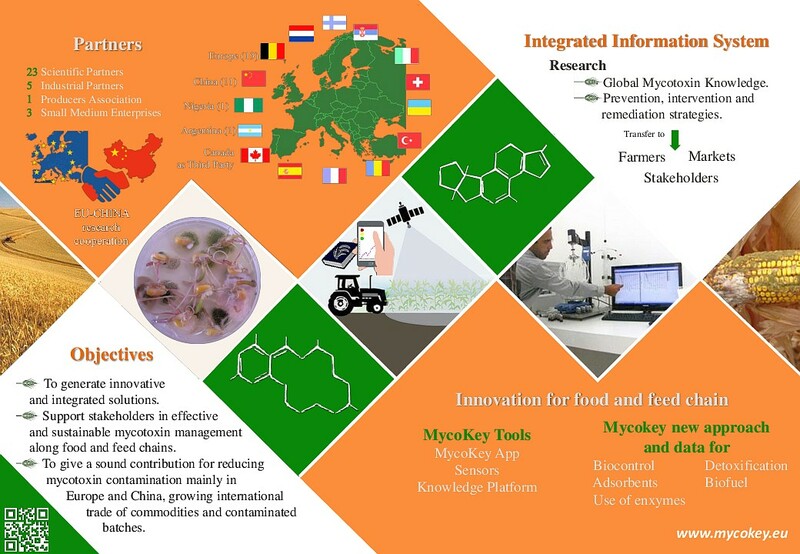 The MycoKey‘s intervention is based on the application of new physical and chemical methods and the toxigenic fungi and mycotoxin management in food and feeds. Emerging technologies will be integrated to improve crops sanitation in pre and post-harvest, processing and storing. Economic evaluation of modified processes will be performed together with the sustainability aspects. Remediation. Effective measures will be used for remediation approach by optimizing and/or developing innovative decontamination/detoxification processes, also at industrial-scale level. The in vivo assessment of the efficacy of mycotoxin-detoxifying agents to reduce mycotoxin absorption in target animal species will reduce the impact of mycotoxin contamination in feedstuffs. Optimized fermentation processes for biofuel production will allow a safe use of mycotoxin contaminated biomasses.